Two short videos timely for telling the difference between the two diseases are linked here. Damon Smith talks about brown stem rot (BSR) of soybean. BSR can be a significant problem in years where the spring is wet and cool resulting in infection by the fungus Phialophora gregata soon after emergence. However, BSR is often not noticed until the reproductive growth stages when foliar symptoms typically develop. The discussion here includes tips on spotting BSR, determining the difference between BSR and sudden death syndrome and how to manage the disease. and scroll down to the “Brown Stem Rot” section. Smith talks about sudden death syndrome (SDS) of soybean. SDS can be a significant problem in years where the spring is wet and cool resulting in infection by the fungus Fusarium virguliforme soon after emergence. However, SDS is often not noticed until the reproductive growth stages when foliar symptoms typically develop. 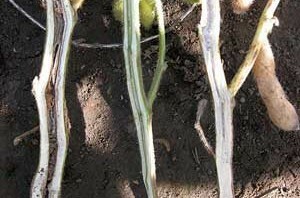 The discussion here includes tips on spotting SDS, determining the difference between SDS and brown stem rot and how to manage the disease. For more information about SDS visit the Soybean Plant Health Topics webpage at http://fyi.uwex.edu/fieldcroppathology/soybean_pests_diseases/ and scroll down to the “Sudden Death Syndrome” section.